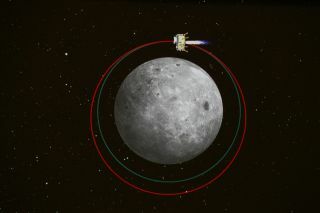 The lunar orbit of China's Chang'e 3 moon lander carrying the Yutu rover is shown in this graphic released by the China Aerospace Science and Technology Corporation. Chang'e 3 will land on the moon on Dec. 14, 2013. China's first moon rover mission is poised for a weekend landing on the lunar surface, an event that — if successful — will mark the country's first robotic landing on another celestial body. China's Chang'e 3 lunar lander is currently orbiting the moon with its solar panels and landing legs deployed. If all goes well, the lander — which is carrying China's first robotic rover — for a planned soft-landing on Saturday, Dec. 14, Beijing Time at Sinus Iridum, also known the Bay of Rainbows. The solar-powered Yutu rover comes equipped with cameras, a robotic arm tipped with science sensors and a radar system attached to its underbelly. The stationary lander itself is instrumented to observe Earth, astronomically eye other celestial objects from the moon, as well as watch the Yutu rover scamper about. China's Chang'e 3 moon mission, the country's first flight to land a rover on the moon, is depicted in this graphic released by the China Aerospace Science and Technology Corporation. The mission launched on Dec. 2, 2013 Beijing Time and arrived in lunar orbit less than five days later. The surface of the moon has not been visited for decades. Apollo 17 moonwalkers packed up their belongings and rocketed off that barren landscape in 1972. Last to explore the moon was the former Soviet Union's robotic Luna 24 sample return mission in 1976. If successful, the Chang'e 3 mission will mark the first time a Chinese spacecraft has touched down on the surface of an extraterrestrial body. "I think a successful landing and rover operations will be of enormous significance for lunar exploration," said Ian Crawford of the Department of Earth and Planetary Sciences at Birkbeck College, University of London. "Just being the first controlled soft-landing on the lunar surface for 37 years would be significant enough, but a successful deployment of only the third robotic rover, and the first equipped with modern instruments, will be remarkable," Crawford told SPACE.com. And apparently there is more to this mission than meets the eye — given what's known about the Chang'e 3's payload for prospecting. The Chang'e 3 lunar lander and moon rover is part of the second phase of China's three-step robotic lunar exploration program. "I have long been interested in the very rich scientific records, which may be trapped in palaeoregoliths sandwiched between lava flows," Crawford said, and Sinus Iridum would be an excellent location to test the concept. There are indications, Crawford said, such layers were detected by the orbital radar carried by Japan's Kaguya moon probe. It was launched in 2007, orbited the moon for a year and eight months, and was purposely impacted on the lunar surface in June 2009. If palaeoregolith layers exist within the uppermost 330 feet (100 meters) or so of the moon's topside, then the Chang'e 3 mission should detect them, Crawford said. While China’s radar-toting spacecraft won't have any means to access such buried layers, "I think the validation of GPR as a means for detecting them, and confirmation of their existence, would be a major contribution to future exploration plans," he said. An artist's illustration of China's Yutu (Jade Rabbit) moon rover on the lunar surface. The rover and a lander are part of China's Chang'e 3 mission to the moon's Bay of Rainbows. Chinese space officials have been clear about surveying the moon and then tapping it for its resources. "China has made no secret of their interest in lunar Helium-3 fusion resources," said Harrison "Jack" Schmitt, a former Apollo 17 moonwalker and professional geologist. He is author of the book, "Return to the Moon — Exploration, Enterprise, and Energy in the Human Settlement of Space." Yutu's belly-mounted radar could give the depth of minable regolith and also identify boulders in that regolith large enough to cause mining problems, Schmitt told SPACE.com. "In fact, I would assume that this mission is both a geopolitical statement and a test of some hardware and software related to mining and processing of the lunar regolith." Schmitt said that NASA's now on-duty Lunar Reconnaissance Orbiter (LRO) has radar aboard that has obtained some very useful data. For example, it identified a buried, second fault that crosses the valley of Taurus-Littrow, the site that Eugene Cernan and Schmitt inspected on the Apollo 17 mission in December 1972. Furthermore, Apollo 17's Command Module pilot, Ronald Evans, operated a radar "sounder" from the Command Service Module in lunar orbit. "I understand that people are still actively trying to process that data," Schmitt said. "Chang'e 3 will invariably break new ground by investigating a new site on the moon, partly with new instrumentation, about which we know very little, by the way. So scientifically, it will advance knowledge," said Paul Spudis, a planetary geology and remote sensing expert at the Lunar and Planetary Institute in Houston. "But its real significance is the development of a lunar surface capable flight system," Spudis said. His question: Why build a lander that can carry nearly 3,750 pounds (1,700 kilograms) to deliver a rover that Chinese media reports as weighing 310 pounds (140 kilograms)? "Clearly, they have other payloads in the queue, waiting to be sent there. Just what, we shall have to wait and see," Spudis said. "Both enable long-term presence on the moon. I'm not sure that the Chinese see it quite that way yet, but they will eventually," Spudis said. This image shows the view inside China's mission control center in Beijing for the Chang'e 3 moon lander and rover mission in December 2013. Pascal Lee, a planetary scientist and chairman of the Mars Institute at the NASA Ames Research Center, Moffett Field, Calif., had done noteworthy work with ground-penetrating radar. GPR can indeed be considered an In-situ Resource Utilization (ISRU) instrument, Lee said, in that GPRs are commonly used on Earth in geophysical exploration. They are used, he told SPACE.com, as the initial phase of subsurface reconnaissance that precedes any actual exploitation — or utilization — of resources. "GPR is a profiling instrument, so it is expected to be operating while the rover is roving, as opposed to when it’s stopped at any particular location," Lee said. China's Yutu moon rover, part of the Chang'e 3 lunar landing mission launching in December 2013. GPR usually has a dipole antenna setup, so one antenna transmits a radar signal into the ground, while the other antenna receives the echoed signal, Lee said. Radar returns are triggered by discontinuities in the physical properties underground, for instance when more or less electrically conducting materials are encountered by the incoming radar signal, he said. "The time of return of various echoed signals tells you how deep things are. The shape and polarization of the returning signal tells you what types of materials are encountered," Lee said. "If different sounding frequencies are available on the GPR, which seems to be the case on the Chinese rover, the higher frequencies are used for probing to shallow depths while the lower frequencies, longer wavelength, are used to probe to greater depths," he said. Usually, GPR does not do well in the presence of liquid water in the ground, Lee said. "In the case of the moon, we are in GPR heaven, and the subsurface is expected to be bone dry when it comes to any liquid water." Lee said that the GPR on Yutu is expected to be a subsurface structural profiler. If that's the case, at higher frequencies, it will provide profiles of subsurface material transitions down to a depth of about 100 feet (30 meters). "It should, therefore, be able to tell us where the lunar regolith transitions to more compact underlying materials. At lower frequencies, it will generate profiles of the deeper subsurface structure of the moon, down to hundreds of meters, provided the rover can rove over distances of order hundreds of meters or more," Lee said. From an ISRU perspective, it's mostly the high-frequency soundings, down to a depth of 30 meters or so that will be most informative, as they will tell you how deep the lunar rubble layer is, "an important piece of information if one has future excavation plans," Lee said. The deep sounding of the lunar subsurface, he said, down to hundreds of meters is more of value in an academic and possible geologic context, he said. The Chang'e rover's GPR is thought to have a penetration depth of 100 feet to nearly 330 feet (30 meters to 100 meters). It apparently can operate in two wavelengths, giving it very high resolution at shallow depths to penetrate through the regolith and into the mare basalts. The other GPR wavelength can penetrate through the regolith and into the mare basalts. Once operating on the moon, the GPR should provide some first order data, said Jeff Plescia, a space scientist at Johns Hopkins University's Applied Physics Laboratory in Laurel, Md. The subsurface distribution of boulders on the moon is unknown, Plescia told SPACE.com. The late astrogeologist, Gene Shoemaker, argued years ago that the subsurface distribution should resemble the surface distribution, Plescia said. "But there is no data. The trenches that were dug during the [Apollo] missions did not go very deep and there were only one or two instances where they thought they hit a rock either in drilling or with a cone penetrometer…which might suggest rocks are rare," Plescia said. Radar equipment onboard NASA's LRO does get some penetration, as does Earth-based Goldstone and Arecibo radar dishes, Plescia said. "But given the spatial resolution it would be more statistical than actually mapping boulders as Chang'e 3 could do," he said. Visit SPACE.com for the latest news on China's space missions and the Chang'e 3 moon landing. Leonard David has been reporting on the space industry for more than five decades. He is former director of research for the National Commission on Space and is co-author of Buzz Aldrin's new book "Mission to Mars – My Vision for Space Exploration" published by National Geographic. Follow us @Spacedotcom, Facebook or Google+. Original article on SPACE.com.